It is an ancient Hindu pilgrimage site which is surrounded by Aravalli Hills. A saint named Galav spent his whole life in search of truth and thereafter this place is known as Galtaji. 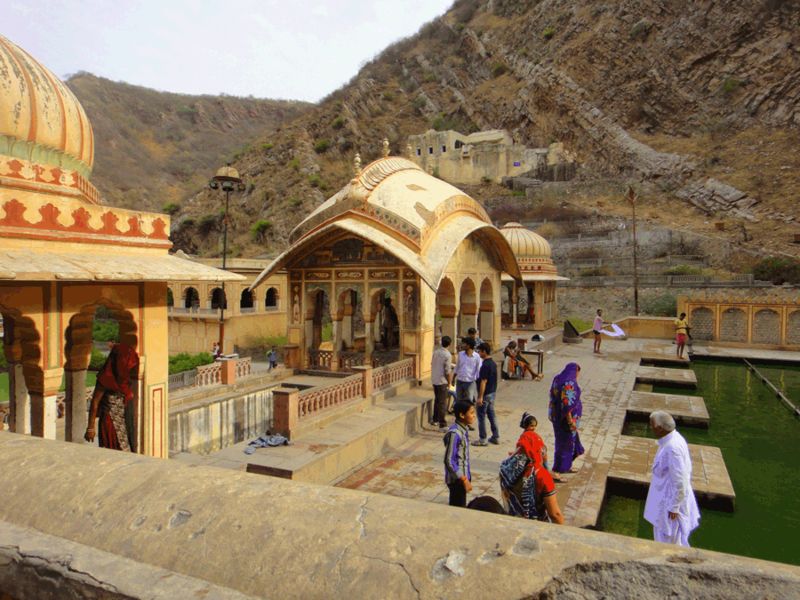 It has a Galta Kund which is a holy water tank and the water of the tank never dries. Taking bath in this holy Galta Kund is considered as pavitra. There are many other temples are also located in Galta ji. One important fact which is linked with this temple is that some part of Ram Charit Manas i.e. Ramayana is written in this temple by Goswami Tulsidas. This place is considered as sacred and holy pilgrim for the Hindus as saint Galav did Tapasaya for several years in Galtaji. But the temple was built by Diwan Rao Kriparam who was a courtier of Sawai Jai Singh II in the eighteenth century, much later. The temple looks like a mansion or a haveli because of its magnificent architecture. This temple is situated at the bottom of the hills in a lush landscape of trees and bushes. Image of Brahma, Vishnu, Parvati and Ganesha are also made on the walls of this temple. It is said that Galava rishi has done severe penance in Galta ji. There are pictures in the temple which shows state occasions and festival celebrations, polo match of maharajas and rasleela of Lord Krishna and Gopis. Galta ji temple is also known as Monkey temple which is situated in the Aravalli mountain ranges in the eastern part of the Jaipur City. There is resevoir in Jaigarh fort , which is situated above the Galta ji temple which contains pure water in that which appears to fall from the Gaumukh or you can say from the mouth of cow. During sunset, many monkeys come to this place. This temple is also named as Jewel of Jaipur. Surya Mandir is also located above this temple. Galta ji temple contains various other temples near it as well as it contains one holy kund in it. Many devotees gather here from various cities during Makar Sakarnti, to take bath in this kund and for removing thier sins , becuase it is considered that by taking bath in this kund will remove all your sins and make you pure. This temple is dedicated to the Sun God, and considered to be one the most famous temples in Jaipur and it is located on the top of the hills. The Galta ji is built with rounded roofs on them, having carved pillars and painted walls which make this temple to look more beautiful. Out of the other temples which are loacted near it, the Hanuman temples have been surrounded by hundreds of monkeys there. Apart from other things, Natural water springs draws special attention of tourists towards it. The water from these scared springs is collected in the tanks or we can say holy kund. There are totla seven tanks here, out of which we can say that Galta ji Kund is the most holiest kund here because the water in this kund never dries us. Taking bath in this kund is considered to be auspicious as it contains holy water in it .